Northrop Grumman (NG), teaming with Gulfstream Aerospace and L-3 Communications for the U.S. Air Force Joint Surveillance Target Attack Radar System (JStars) replacement competition, believes it could have a platform ready to replace the current E-8C aircraft three years ahead of the current plans. Like rival contender Boeing, NG has not yet confirmed a partner for the radar. The USAF last month awarded pre-engineering and manufacturing development (EMD) contracts valued between $9.9 million and $11.5 million to Lockheed Martin, Boeing and Northrop Grumman teams to assess maturity, risk and costs of a potential replacement for the current E-8C fleet. Under the most recent USAF timeline a full EMD contract would be awarded in 2017 with initial operating capability (IOC) targeted in 2024. Speaking to reporters September 2 at Gulfstream’s facility in Savannah, Ga., Northrop, Gulfstream and L-3 officials said their offering is based on existing systems, and said they could achieve IOC in 2021, ahead of a potential peak spending period in the middle of the next decade. Because of this, the Air Force may need to “flatten out” its budget, said Alan Metzger, vice president and JStars lead for Northrop Grumman. Introducing the new platform earlier will bring substantial cost savings over the ageing E-8C, particularly fuel consumption, which could be 80 percent lower. The Northrop Grumman team is planning to offer the Gulfstream G550 long-range business jet, but Metzger is not ruling out a switch to the larger and faster G650 should requirements shift and dictate need for a larger aircraft. Boeing is offering a 737-700, while Lockheed has teamed with Bombardier to offer a Global business jet variant. Northrop officials are uncertain when the USAF will finalize program requirements. An Air Force analysis of alternatives suggests that a “business-class jet” with a mission crew of about 10, compared with 18 on the current JStars, would be an appropriate platform. Metzger noted that the current JStars fleet has undergone a number of block changes and upgrades and more than 20 items have been added. But the weight actually went down, reflecting lighter materials and smaller equipment. “The technology is going to continue to miniaturize,” he added. What they lose in terms of onboard space would be recouped in cost, added Troy Miller, Gulfstream’s regional vice president, military and special mission sales. He said that a Boeing Business Jet, based on the 737-700, has operating costs that are roughly 46 percent higher than the Gulfstream G550. Northrop has been testing equipment on a Gulfstream G550 testbed for the past couple of years. The aircraft design provides clear fields of view for radar sensors, Metzger noted. Along with the equipment, the company installed a ventral fin to enhance handling capabilities. Metzger said the flights have confirmed the performance of the modified aircraft, which is certified to fly up to 51,000 feet, can climb direct to FL410 in under 25 minutes and have 14-to-15 hour loitering capability that translates into a 6,750-nm range. Northrop has not made a final decision on radar, considering its own offering as well as a Raytheon product. This also may be determined by final program requirements, he said. While a smaller aircraft may dictate a smaller radar, Metzger noted the G550’s high-altitude capability will enable a greater field of view. Also in the works is the air-to-air refueling system, with the team looking at a couple of options. Gulfstream would produce the G550 on its G450/550 lines and hand over a green airplane to team members for modification. The companies plan to leverage existing supplemental type certificates to speed the process and use proven commercially available systems, Metzger said. Gulfstream has remained relatively quiet about its government and special missions applications, Miller conceded. The company has placed 186 special missions aircraft in 38 countries, including 70 with the U.S. government. These aircraft have been used in applications such as executive transport, air ambulance, maritime patrol, conformal airborne early warning, atmospheric research and intelligence, surveillance and reconnaissance (ISR). 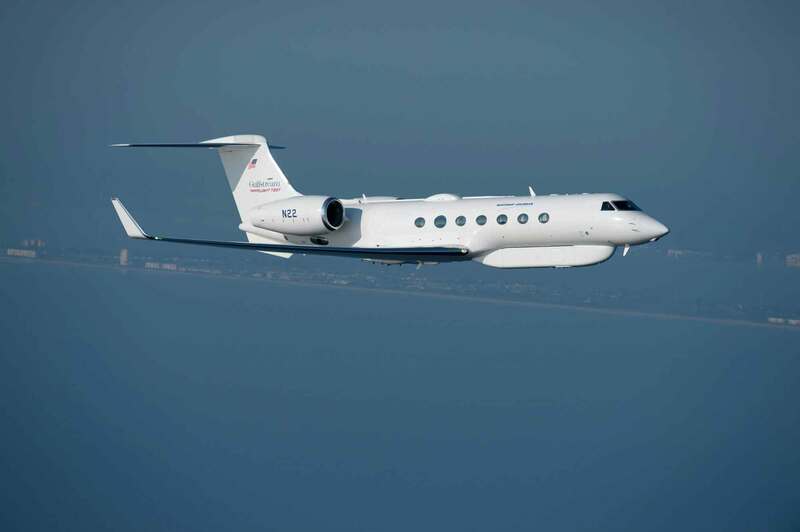 Additionally, Israeli Aircraft Industries (IAI) has integrated ISR capabilities on the Gulfstream V and 550.